Yum Brands (YUM) -- home of Taco Bell, KFC and Pizza Hut restaurants -- is expanding a test of another chicken concept, specializing in chicken tenders and fried chicken sandwiches, with hand-cut fries and frozen custard. 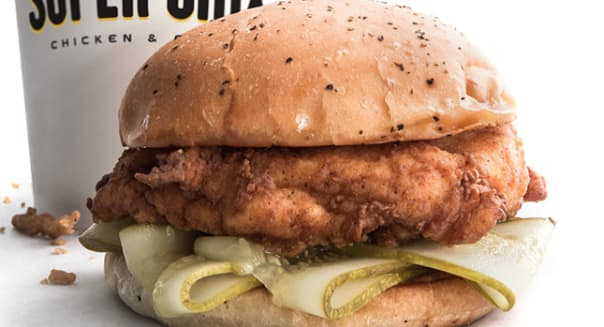 The first Super Chix opened 11 months ago in Arlington, Texas, and Yum Brands just announced that it will open a second location next month in Dallas. "The last true chicken sandwich," the chain promises on a huge sign that takes up one wall, likely a shot at Chick-fil-A's bragging rights for inventing the chicken sandwich. Potato sacks line the queue, and that's either a tip of the hat to Five Guys or a not-so-subtle way to remind patrons that it does cut its fries in-house. The design is slick and modern, just as one finds at most of the leading fast-casual chains. It will take some time before the fast-casual Super Chix moves the needle at Yum. After all, we're talking about a company that kicked off 2015 with 14,197 KFC, 13,602 Pizza Hut and 6,199 Taco Bell locations. It's also important to point out that Yum considers Super Chix an "exploratory" concept. The company's not ready to begin an aggressive rollout of the concept, though opening a second location just 12 months after opening the original test concept would seem to bode well. Other recent exploratory concepts at Yum have been slow to scale. Yum opened KFC eleven -- a fast-casual spin on its top chicken chain -- near its home base of Louisville two years ago. It also opened U.S. Taco Co. -- an upscale spin on its own Taco Bell, featuring premium Mexican eats, including $10 lobster tacos -- in California last year. Super Chix appears to be the exploratory concept with legs, and given Yum' resources, it wouldn't be a surprise to see it expand quickly once the second location opens in Dallas in a few weeks. Yum can use the boost. Worldwide system sales inched a mere 3 percent higher in 2014, and that was after it opened more than 2,000 new international eateries throughout the year. There were struggles in its important Chinese market, but also lackluster growth closer to home despite introducing a breakfast menu at Taco Bell. Pizza Hut continues to meander in a competitive pizza market, and KFC still can't seem to shake the unhealthy connotations of its offerings. Motley Fool contributor Rick Munarriz has no position in any stocks mentioned. The Motley Fool has no position in any of the stocks mentioned. Try any of our Foolish newsletter services free for 30 days. Check out our free report onone great stock to buy for 2015 and beyond.